Hebrew University of Jerusalem archaeologists have discovered a massive and elaborate entryway to the Herodian Hilltop Palace at Herodium National Park in Judea, south of Jerusalem. The newly discovered entryway is remarkable in that it features a complex system of arches on three separate levels, allowing the King and his entourage to directly enter the Palace Courtyard. Thanks to the arches, the 20-meter long and six-meter wide corridor has held up over the nearly 2,000 years since it was built at a height of 20 meters. Archaeologists Roi Porat, Yakov Kalman and Rachel Chachy worked on the excavations that were conducted over the past year as part of The Herodium Expedition in Memory of Ehud Netzer, a project in memory of the university’s famous professor who found the tomb of Herod the Great and passed away in 2010 after being wounded in a fall at the Herodium site. 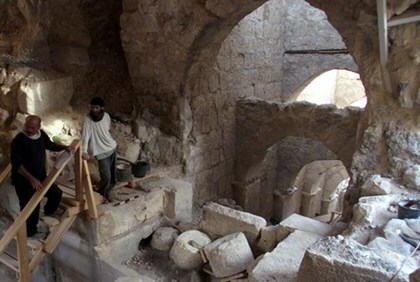 According to the three archaeologists who unearthed the find, the corridor was built by King Herod (73-4 BCE) as part of his plan to turn the Herodium site into a fortress palace. However, the dig found evidence that the corridor was never actually used, as Herod apparently was aware he was nearing his death and converted the hilltop complex into a burial monument instead. The corridor evidently was put on the back-burner at the end of Herod’s reign, with a monumental stairway apparently built over it at the time. Not only was the arched corridor built over, but in fact the excavators found indications that other structures built earlier by Herod on the hill’s slopes including the Royal Theater were given a similar treatment. In fact, the only finding that was not covered over during construction was Herod’s fancy mausoleum-style burial-place. By unearthing the corridor entryway, the original Palace vestibule was also exposed in all its glory, replete with painted frescoes. Also found was evidence, such as Jewish Revolt coinage and temporary structures, testifying to how Jews fighting the cruel Roman occupation in the Great Revolt (66-71 CE) used the site. Evidence of a later rebellion was also found in the corridor, in the form of hidden tunnels dug on the site during the Bar Kokhba Revolt (132-135/6 CE) by Jewish rebels as part of their guerilla warfare against the Romans. These tunnels, which were partially supported by wooden beams, exited the fortress through the walls in openings hidden in the corridor. Shaul Goldstein, Director of Israel’s Nature and Parks Authority, said that in the future the corridor will be used to allow visitors to directly access the Herodium palace-fortress in the same way Herod entered it around 2,000 years ago.